Preview images for the NCIS: Los Angeles episode "Plain Sight"
After weapons with a $1 million street value are stolen, the team tracks the evidence to a wealthy charity event, prompting Mosley to be added to the guest list with Callen and Sam as her security detail, on NCIS: LOS ANGELES, Sunday, Oct. 22 (9:30-10:30 PM, ET/9:00-10:00 PM, PT) on the CBS Television Network. "Plain Sight" -- Pictured: Chris O'Donnell (Special Agent G. Callen) and LL COOL J (Special Agent Sam Hanna). 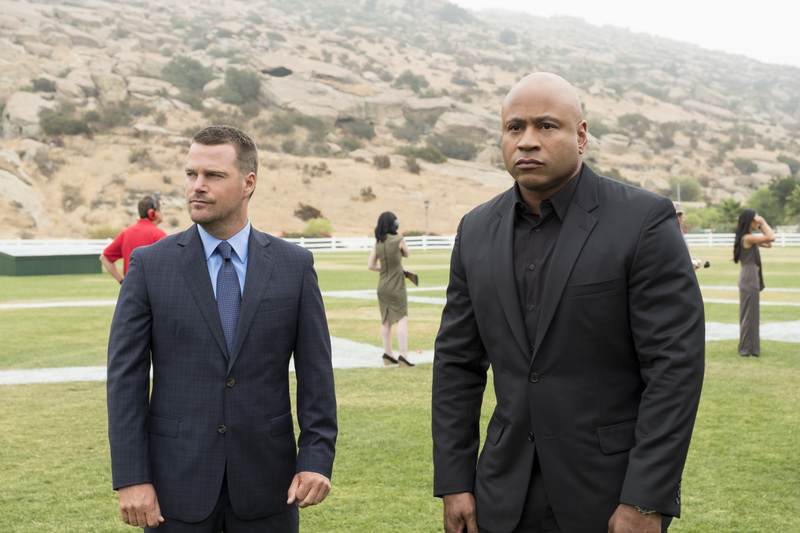 After weapons with a $1 million street value are stolen, the team tracks the evidence to a wealthy charity event, prompting Mosley to be added to the guest list with Callen and Sam as her security detail, on NCIS: LOS ANGELES, on the CBS Television Network. Photo: Jessica Brooks/CBS ÃÂ©2017 CBS Broadcasting, Inc. All Rights Reserved. Recurring cast appearing in the episode includes Andrea Bordeaux as NCIS Special Agent Harley Hidoko; additional guests include Eddie George (Byron Brown), Rocky Marquette (Tony Young), Chris McGarry (William Bradford), Rebecca Wiscoky (Sasha Livingston), Joseph C. Phillips (Charles Livingston), Chad T. Wood (Supervisor), Eddie Alfano (Security Guard), Tre Hale (Felix Swoope), Lauren Jenna (Yvette Jackson), Xingu Del Rosario (Jack), Alejandro Barrios (Connor Murray), Djakarta (Deborah), Clay Wilson (Marcus), and Colin Wilson (Kevin).